We got a new waffle maker for Valentine’s Day. One that has ♥ heart shapes. This recipe makes very nice waffles. They were not as bright red as I thought they would be and the beet flavor is not really noticeable. However, the flavor combination with the raspberries made a lovely dessert and treat for Valentine’s Day. Peel a small red beet. Cut in small pieces cover with water and cook until soft. Add water as needed to insure that it does not burn. Once the beet is soft, puree it and allow to cool. When the beet and water/ juice have cooled puree to a smooth consistency. Drizzle in the almond milk and pureed beet. Add the liquid mixture to the dry ingredients, along with the melted margarine. If the batter is too thick add a bit more of the almond milk. Add the water, sugar, cornstarch. Lightly spray the hot waffle iron on both the top and bottom surfaces with nonstick spray (depending on your waffle iron). Add just enough batter to cover the cooking surface-approximately ½ cup for a standard waffle (1 cup for a Belgian waffle). Cook for 2 to 3 minutes, depending on your waffle iron. Don’t over-bake- you want it crisp and brown but not too dark. 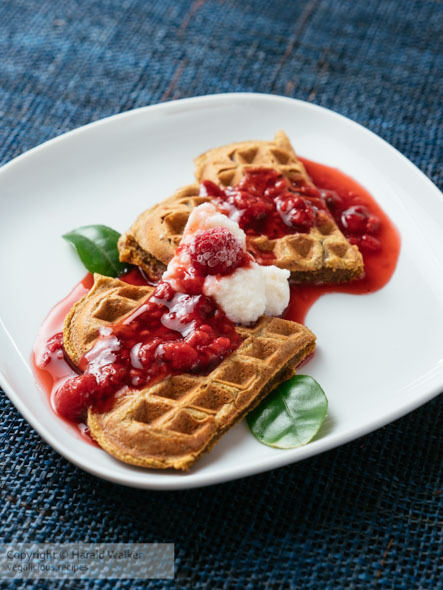 Serve the waffles with the berry sauce on top and a small dollop of non dairy whipped topping. 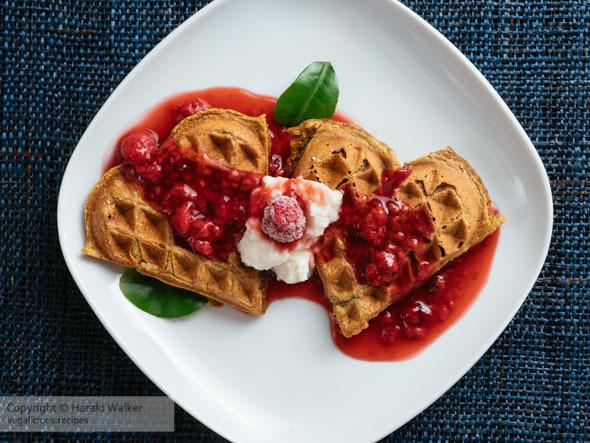 Posted by Chris Walker on February 13, 2019 in Beet, Desserts and Sweets, Raspberries.